In Italian, when you want to say that someone is ugly, you call him “Carciofo”, Artichoke. Not only that they are not really good looking, it takes some efforts to clean the external non-eatable leaves and peel their stalks. The worth is yet to come: they also leave black stains on your hands if you don’t use gloves. Fresh lemon will normally remove most of the stains, leaving though a dark shadow in between your fingerprint. In did, artichokes are rather complicated to handle. Why should one bother, then? There are easy to use frozen artichoke hearts, canned ones for whatever dish one may think about. Allora, the well known argument about eating fresh and seasonal values twice when it comes to artichokes: not only because their amazing source of iron being lost as a treated food, but most of all due to two main considerations we have in the kitchen: consistency and taste. In the market they might look like a beautiful flowers bat. When you meet them again in the kitchen you find them stabbing and rough. After removing the external leaves you reach the tender ones that keep a special consistency in any cooking method or manipulation: crisp as crostini on a toasted bread, semi melted in risotto, mild in a warm salad. When it comes to taste, those of the artichokes are unmistakable. It is either adoring their taste or recoil it. I often find people have same strong feeling towards fresh coriander. You either love it or stay away from it. Being on the favourites side, I have artichokes only seasonally (January to March, here in Tuscany), what guarantees its original nutrition’s values and that the ironish strong-present taste will provide the right intensity and impact for any dish I cook. Besides being a great source of iron, artichokes provide a large variety of local dishes that differ in their look, flavour and “role” in the meal. 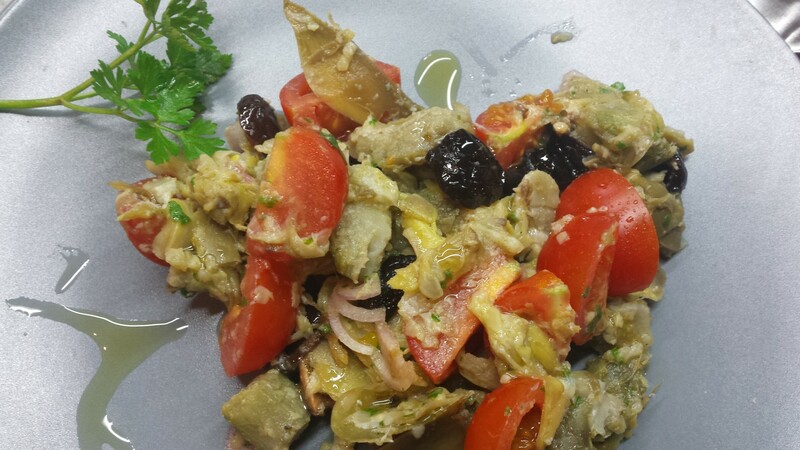 I recently combined artichokes to black olives for a tepid salad. We had it for lunch accompanied with whole wheat bread and cheese.